Tonight's episode of Chittod Ki Rani Padmini Ka Johur will show the beautiful queen Rani Padmini's wedding ceremony. Tejaswini Lonari, who plays the title character, looks splendid in her bridal finery, styled on the lines of Aishwarya Rai Bachchan's look in Jodhaa Akbar. 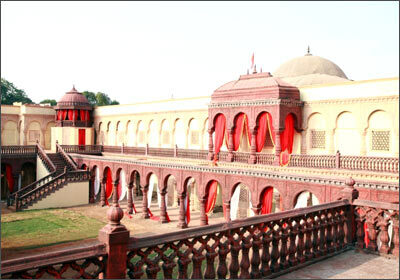 In fact, the TV show is also shot in the same sets as Ashutosh Gowariker's historical. 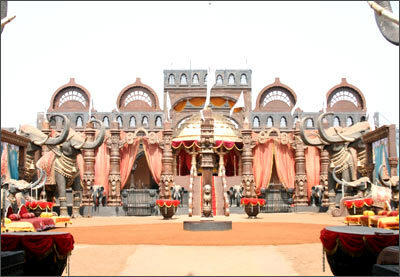 It was art director Nitin Desai's idea to re-use the film sets for a TV show, as he could not bear to dismantle it. He is producing the show now. "The skeleton and the basic things are the same but the sets have been modified according to the needs of the serial. 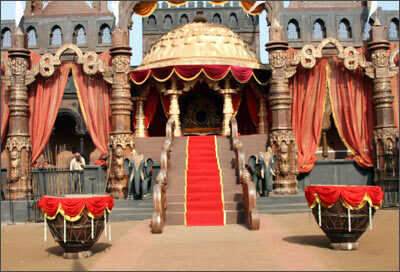 So it's not entirely the Jodhaa Akbar set," Desai explains. "I don't like to repeat my creativity but keeping these sets idle is like keeping a white elephant -- the maintenance costs are very high. It's our studio creation and I don't think it's wrong to use it. It's heart-breaking to dismantle the sets that have been painstakingly created over a period of time. But when you see your new creation, it gives creative satisfaction." The look of the lead characters of this historical drama has been designed by designer Neeta Lulla. The look and styling bears a striking resemblance to Aishwarya Rai's in Jodhaa Akbar. Talking about the costumes, Desai said, "Neeta is a good friend of mine and our colours palettes always match. We have worked in lot of films and have a successful combination. One cannot afford her for these kinds of projects. But it was really sweet of her to design for us. She has given rich, grand and elegant designs." Desai said the estimated budget for the costumes is Rs 60 lakh. The wedding outfit is the most expensive costume they have used so far, at Rs 16 lakh. "We have used real jewellery on this show, hired from PNG jewellers, Pune," Desai says. "I designed the jewellery and sent it to the jeweller. It was then made with their inputs. The jewellery meant for the wedding scene is worth Rs 1 crore." As Padmini is decked up with such expensive accessories, Desai said they have gunmen guarding her during the shoot. Desai, who has worked on television projects like Tamas, Discovery of India and Chanakya, said, "I always felt the urge to produce a television show. I was looking for a women-oriented show after I got good reviews for my regional television show Raja Shivaji Chatrapati." Asked why he choose the story of Rani Padmini, he replied, "People in Chittod worship Rani Padmini. She was a complete woman known for her great beauty, as a warrior and for her sacrifices. I was always been fascinated with the culture, colours, food and hospitality of Rajasthan." Desai also loves the culture and architectural value of different centuries. "I do a lot of research before working on projects. After doing Shivaji in Marathi, I was approached by different channels to do television shows. But Sony was the first one to approach me and I went with a couple of subjects. They asked me to do Rani Padmini because they could see my passion for the subject." 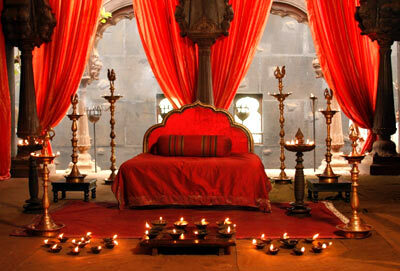 "Shivaji and Rani Padmini are passionate cinema on television done on a grand scale. We are shooting these television shows with four Red cameras to get the best quality, which is mostly used abroad for films and rarely used in India. Our television shows have the standards of international films," Desai said. There had been a lot of speculation regarding the upcoming soap on Zee TV, tentatively titled Rani Laxmibai. The latest development on the show is that it will be co-producer by Desai and the production house Contiloe Films. "I am producing many more shows for different channels but it's too early to talk about it," said Desai. Watch Chittod Ki Rani Padmini Ka Johur from Mondays to Thursdays at 8pm on Sony Entertainment Television.